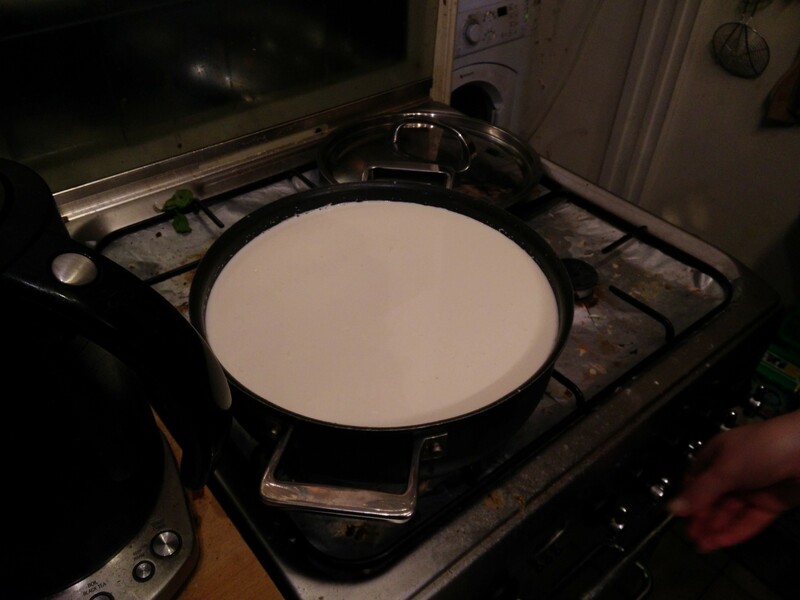 Soph got me a cheese-making kit for xmas, and we’re testing it out by making mozzarella, which we’ll use for a sourdough pizza. In the summer we’ll take the final step and use garden tomatoes to to make the tomato sauce to make the entire thing homemade! 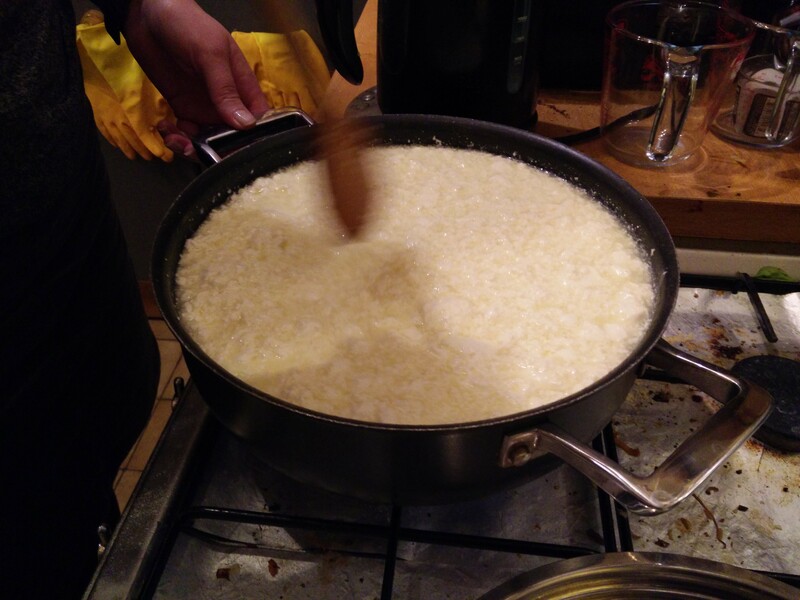 It all starts with 4 litres of whole milk and 500ml of single cream, which we sour with 1.5 tsp of citric acid granules dissolved in 50ml of cooled boiled water. This gets heated to 32C before a vegetarian rennet substitute is added. This comes in tablet form, and just 1/4 of a tablet is dissolved in 50ml of cooled boiled water. It’s then left with the lid on. 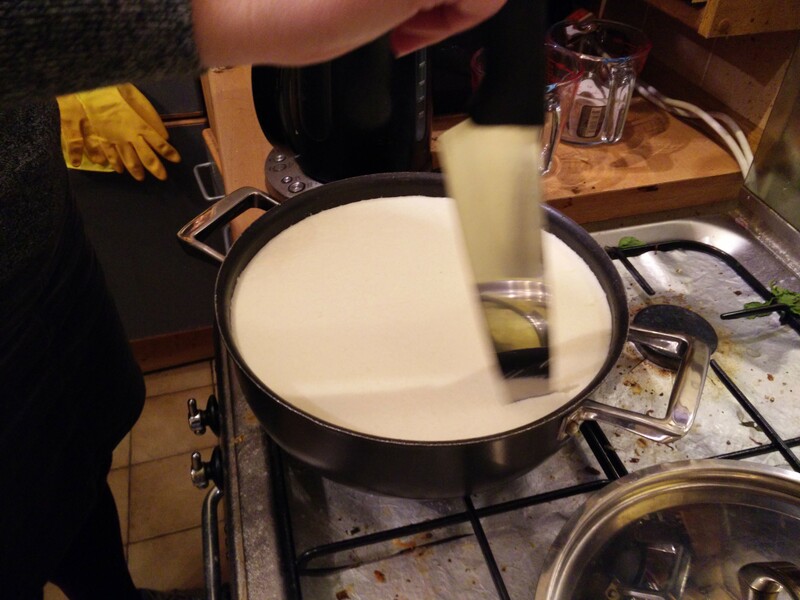 After 20 minutes the curds and whey have separated, and the curds are cut up before returning to the heat to bring to 40C while stirring. 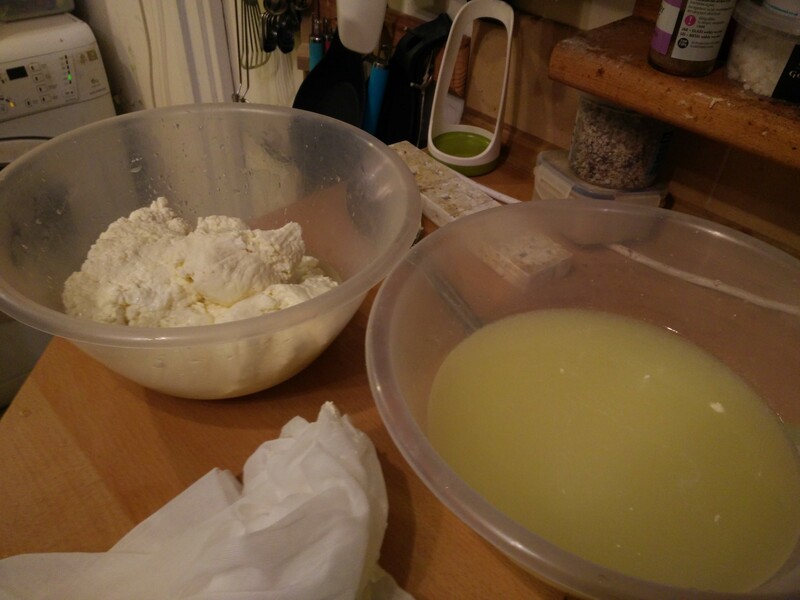 Then the curds and whey are separated. 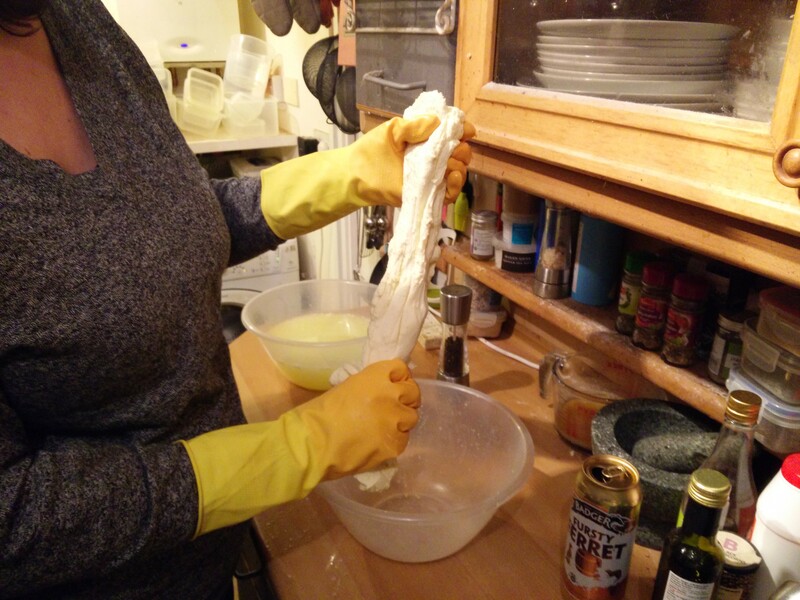 The curds are then salted before being microwaved and kneaded until they become stretchy. Then apparently you can finish by kneading in basil or chilli flakes. 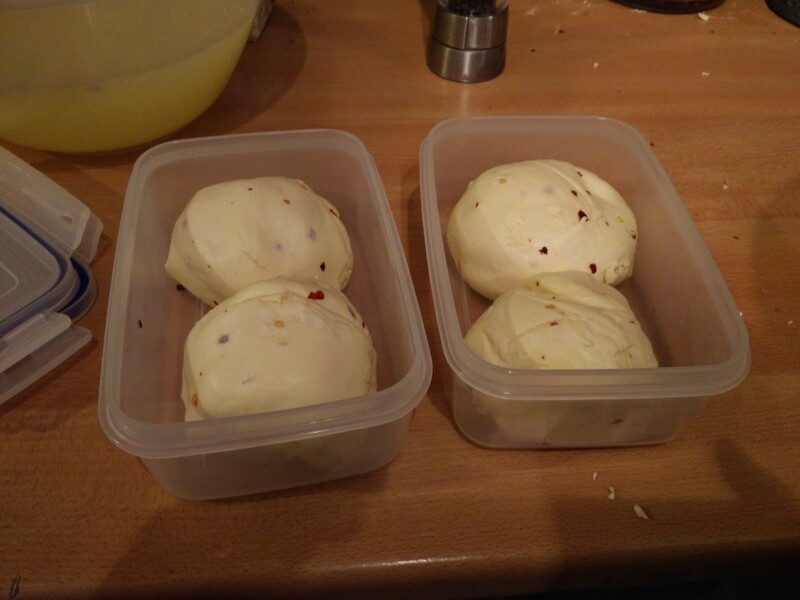 Guess what – we chose chilli flakes! Then we split into four balls and popped in the fridge. So, time to prep a pizza, using our sourdough base, and a tomato purée, balsamic vinegar, herbs & spices base, plus our cheese! 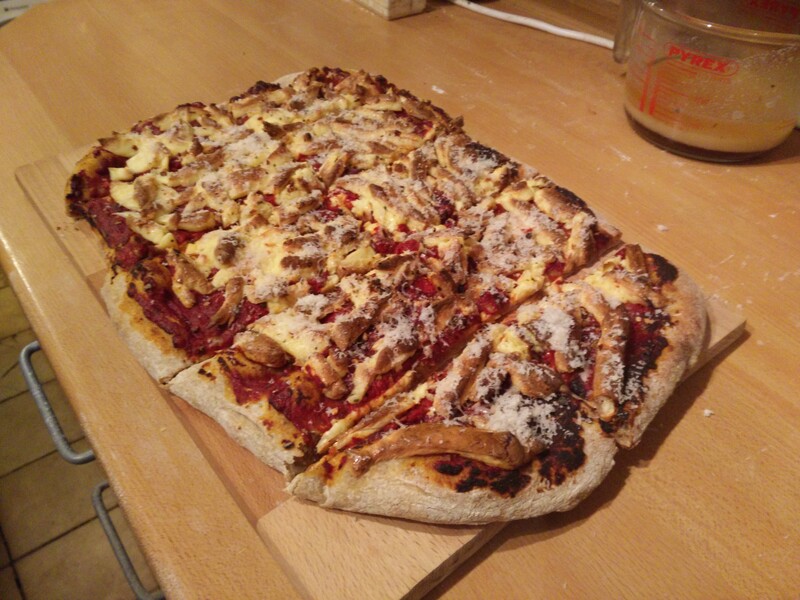 Put onto pizza stone in the oven at max temp for 10 mins… and it food time! MMMMMMmmmmm that’s a damned good pizza! 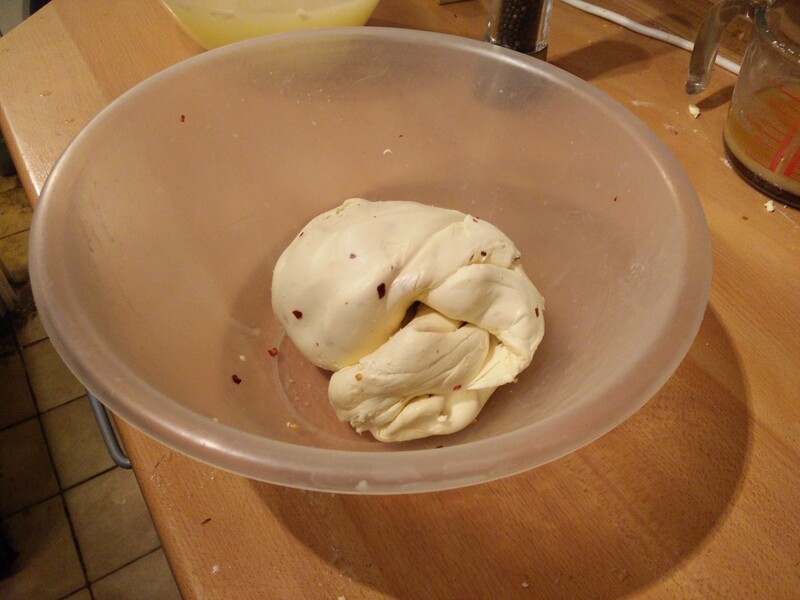 The mozzarella taste like mozzarella, but the texture is more like halloumi — hardish and not very stringy. I think we over-kneaded it as too low a temperature. Guess we’ll have to try it again! 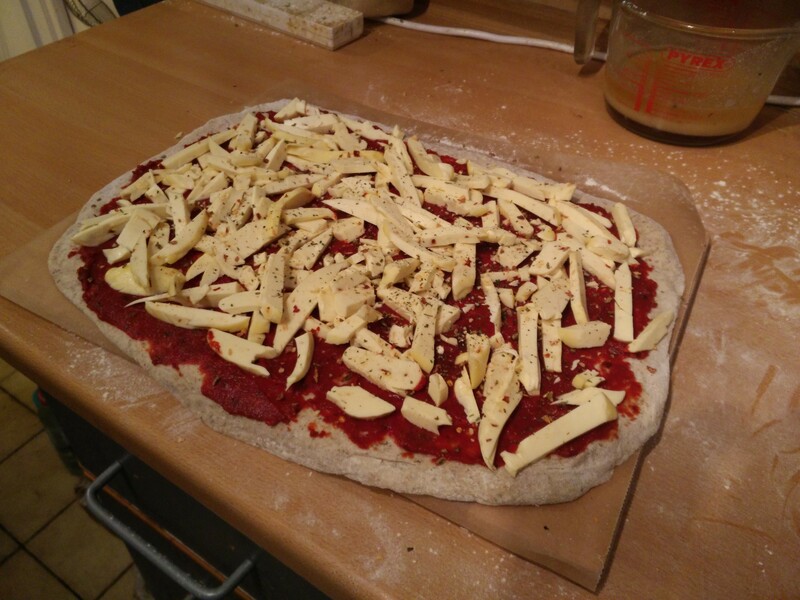 Then again… mozzarella without all that stringy mess makes it much easier to eat! Plus the pizza is the best we’ve done. Putting it in the proofer at 28C for 90mins after the dough comes out of the oven, and cooking at max oven for 10 mins on the stone really worked well. WOW !!! That was very adventurous. I suspect you watched the 4 litres of milk very carefully – you wouldn’t want that lot boiling over. Well done with that new venture.